This wrist bell is ideal for children, and is a great educational toy for children, cultivating their art and wisdom. It can also be used as performance props for schools or celebrations. When walking or shaking, it must be a prop for your music theme. Each wrist bells has 4 bells. Wear it on your ankles or wrists, the wrist bells will make a wonderful sound as your wrist moves. Let your baby enjoy the touch and wear, encourage them to explore, and cultivate the rhythm and music talent. A variety of bright colors can capture your baby's attention and bring them more fun. Package includes: 4 pairs of multicolored wrist bells (red, yellow, green, purple), two vocal cartoon animal castanets, two rainbow handbells. Material: Nylon and metal. The wrist bell is also quite durable and a good helper for school and family education. Size: Wrist bell size 20x2.5 cm. The design of adjustable Velcro is suitable for all babies, children and adults. Castanet size is 5.5x3 cm. Handbell length is 18cm. 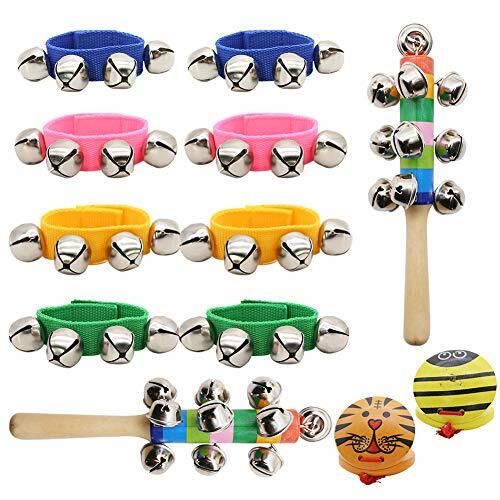 PACKAGE INCLUDES -- 4 pairs of multicolored wrist bells (red, yellow, green, purple), two vocal cartoon animal castanets, two rainbow handbells. MATERIAL -- Nylon and metal. Adjustable nylon Velcro, suitable for all babies, children and adults, each wrist bells has 4 bells. A variety of bright colors can capture your baby's attention and bring them more fun. It is also quite durable and a good helper for school and family education. If you have any questions about this product by MCpinky, contact us by completing and submitting the form below. If you are looking for a specif part number, please include it with your message.